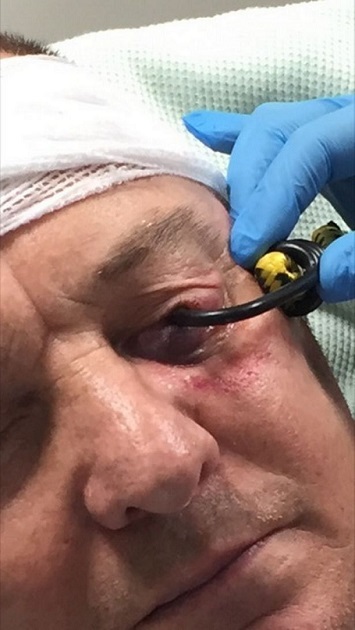 A man was left screaming in agony after a metal hook embedded in his eye in a freak accident. Roy Alexander was rushed to hospital after a bungee cord snapped into his face as he was preparing to take rubbish to the tip on Sunday afternoon. His horrified wife raced outside after hearing her husband screams and found him with the elasticated cord dangling from his eye. 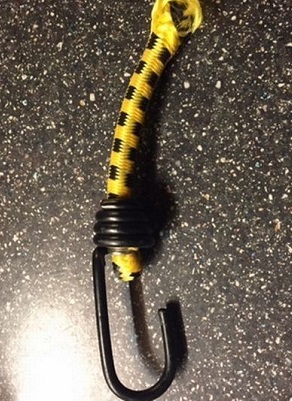 She had to cut the cord, which was still attached to her husband's car,in what she described as "like something out of a horror movie." Mr Alexander, from Skelmersdale, Liverpool, shockingly said he couldn't feel a thing at the time, because he was in shock. But their eight-year-old Grace was left “very upset” according to Mrs Alexander after she witnessed the horror incident. Doctors at Aintree Hospital managed to remove the hook and are now battling to save the sight in the 55-year-old’s left eye. His wife Judith said her husband, a security guard at Edge Hill University , was staying positive and praised hospital staff and paramedics for the care he received.